You Are Here: Home / Perspectives, Slider, Uncategorized / At the Brink of War! At the Brink of War! Back in April we ran a Daily Bow story on the Spektral Quartet and their current project “Theater of War.” The project, a response to the growing reality of alienation in and towards soldiers who attempt to reintegrate into society after returning home from wars in Iraq and Afghanistan, will premiere next week on May 23-24 following the conclusion of the NATO summit. 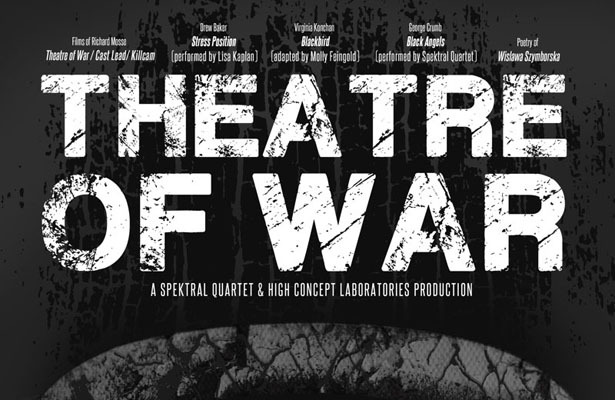 In collaboration with High Concept Laboratories, the Spektral Quartet will present “Theatre of War” as an artistic investigation of the contemporary disconnect between the experiences of most citizens and those of people directly impacted by war. This multi-disciplinary project aims to raise funds for the Vet Art Project. A collaboration between the disciplines of music, film, theater and the written word, Theatre of War is borne from a place of not-knowing. The program does not provide a consistent position statement so much as it constitutes an inquiry into the alienation felt by many Americans: the alienation of the soldier from civilian life, of the average US citizen from victims of torture, of the dissociative, technological methods of remote-control weaponry from its human casualties – and the notable lack of spiritual disquiet in our society at large as so much destruction occurs around the world. The event will take place at Chicago’s historic Chopin Theatre. Check out the event details below!